Looking for a competitive edge in real estate sales. It’s no longer enough to vacuum up the dust bunnies, take the kiddo artwork off the fridge, and mow the lawn before listing a house for sale. The common sense advice handed out by real estate agents has morphed into a whole new industry in the last few years: home staging. The idea is that an injection of style (not to be confused with substantive renovation projects) will make a house more competitive against others on the market. There’s even advice available on how to stage a garage. Staging is such a big deal that Barb Schwarz, a real estate agent from Washington state, claims to have created the term. She registered it as a trademark and developed the Accredited Staging Professional Course – naturally in conjunction with media appearances, a DVD, and a book containing many exclamation points. She says on average 95 percent of staged homes sell in 35 days or less, whereas homes that are not staged take at least 172 days to sell. Schwarz writes that most people can’t imagine themselves in a house when they first look at it because they’re distracted by clutter, dirt, bad colors, or what she calls cold emptiness. What potential buyers see or don’t see as they pull up in front of a house – its so-called curb appeal – might be enough to make them drive on. Trees and shrubs that obscure the view from outside are also probably blocking the light from coming inside. But curb appeal is just the start. Staging should be part of the plan whether a home is lived in full time or seasonally, or has been vacated or newly constructed – the height of cold emptiness. Langdon Clarke at Edgartown’s Wallace & Co. Sotheby’s International Realty says staging is done increasingly for new construction. “People are very visual and they need to see the front hall and first couple of rooms staged,” he says. 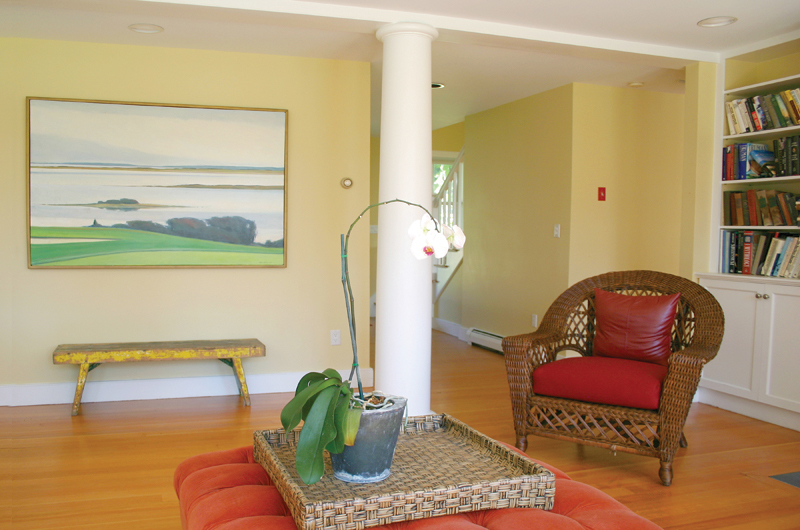 “Frequently builders are willing to spend $10,000 to $20,000 for furniture in the living room, dining room, and family room and then include it in the purchase price.” He says off-Island real estate agents work with furniture rental companies, but on the Vineyard there’s the problem of how to get it here and where to store it. “With existing homes, owners who are willing to listen to comments from agents about cleanliness, proper furniture placement, and eliminating personal memorabilia are the ones who sell their houses,” Lang explains. She agrees that trying to have an inventory of furniture to rent out on-Island is hard. “Without room for storage you could only have a few pieces and then buyers would end up seeing the same sofa in different houses,” she says. Although she loves doing historic homes, she works with everything from antiques to contemporary furniture. And for some showings, she says, all she does is bring some flowers and her own tablecloth. Louise Sweet of Vineyard Haven has been a floral designer for more than thirty years on the Island; she’s worked as a retail florist, a private consultant, and now specializes as a wedding flower designer through her company Flowers on the Vineyard. This year she started Staging on the Vineyard as an extension of her floral business. She thinks styling an event isn’t that different from staging a home and has been helping friends with staging for several years. In some cases she has also advised friends about home renovations. Louise thinks she offers a fresh eye to help owners present their houses in the most appealing way. “I start by asking clients to remove their highly personal pieces and clutter,” she says. “Sometimes I suggest that they paint, change the floors, change the rugs, or rearrange some artwork.” She likes to set the dining room table with china, linen napkins, a bottle of water or maybe a bottle of wine, and glasses. When furniture looks worn or outdated, Louise won’t ask owners to buy anything new; instead she arranges to rent a few pieces. “I tell people to bring out everything Vineyard,” she says, including coffeetable books, seashells, or artwork. She thinks it’s smart to have a copy of the home plans available as well. “It’s a way of saying there’s nothing to hide, nothing bizarre.” Although there is a lot of inventory available on the housing market, Louise thinks sale prices are holding steady even as people are looking for bargains. While many houses for sale on the Island are second homes and may be used as rentals, she says owners still tend to accumulate personal belongings in them. She helps with the logistics of preparing for a last-minute showing: With an owner in residence that might mean giving advice such as stashing board games and toys, but for an owner who is gone for the season it could just mean adding fresh flowers. When Louise sold her own home, she says her work at staging it played a major role. From experience she advises, “Remove anything that you cherish, because it can become part of the negotiation.” That could mean the selective removal of particular pieces of furniture, artwork, or even window treatments. Annie Parr at Island Interiors in Oak Bluffs approaches home staging as just another form of consultation she provides to clients. She doesn’t advertise the service, so new clients find her by word of mouth. She sees her job as neutralizing the house to make it appeal to as broad a market as possible. “I love the challenge of turning around a home quickly and tastefully,” she says. A few times she’s had clients like what she’s done so much that they decide not to sell after all. Because of the economic downturn and increase in the number of houses on the market, her staging consultation business has taken a big leap, although she does think the home sales market is picking up slowly. Annie points out that the Vineyard market is different because many homeowners have several houses and are just letting one go. Perhaps in those cases, there is less of an emotional investment and fewer personal belongings to deal with. “I love reinventing things,” she says. “If you put the money in, you’ll get the money out.” She might advise a client to paint colored bathroom tile white, change a rug, or add planters and shrubs to the garden. “You have to decide what you can gloss over and what you can’t,” she says, adding that she sees many cases where a $2,000 investment can return $15,000.